For all businesses today, no matter what their size a website is a must, an online shop window showcasing their products and services. For many SME’s the development of their website is a significant investment which makes it surprising that many business owners don’t track how well their site is performing and whether they are getting a return on their investment. The most obvious way to determine how well a site is performing is though the leads and enquiries that are generated, but unless the business is specifically recording and analysing their enquiry data it can often be difficult to gauge how well the site is contributing to the numbers and even more difficult to know how much missed potential there is. In our experience for many SME’s website performance often comes down to more of a “gut feeling” than hard facts, particularly where marketing across multiple channels is being undertaken. The following is a brief overview of the some of the key metrics that Google Analytics can provide a business owner as well as a few pointers on how to ensure the accuracy of the data compiled. Google Analytics is just one of a number of tools that can be used to measure website performance. Total Users – the total number of visitors to the website in the selected time period. All of these metrics can be located within the ‘audience overview’ button available under the performance summary on the homepage of the analytics account (see below). Within this and all sections of analytics, the date selection area in the top right corner enables you to define the period of data you wish to analyse. The ‘compare to’ checkbox also enables data from across 2 periods to be compared which is particularly useful when looking at performance month on month or year on year to spot trends. Whilst there are countless metrics that can be used to measure performance, two of the most straightforward and telling for SME’s are bounce rate and average session duration. A ‘bounce’ occurs when a user visits one page on the website then leaves without visiting another one. The bounce rate of a website is calculated as a percentage of how many users only browsed one page on the website. High bounce rates generally indicate that the website content is not relevant to the user’s landing on it. If the bounce rate is high (70-80%), the site content should be reviewed and improved to help retain visitors interest, internal links and calls to action used to drive the visitors to other parts of the website. It is important to review individual page bounce rates as well as that for the entire site. A high bounce rate on a single page isn’t always necessarily a bad sign, as users may consume the page in detail, find what they are looking for then take an action that would be recorded as a bounce. For example, a user searches for “contact your business”, the businesses contact page comes up in the search results page and the user clicks through. They collect the contact details, give the business a call and leave the site – this would constitute a bounce but in fact the page has performed as it should. Average session duration is the average length of a user visit to the website. Average session duration is calculated as a measurement of time by dividing the total duration of all sessions by the number of sessions. A low average session duration indicates that users of the website aren’t resonating with the website, this could be due to the design, lack of Calls to Action, slow load time or poorly formed content amongst other things. As well as the overall average session duration for the site as a whole, note should be taken of the figure for each page individually as in conjunction with individual bounce rates they can help to identify underperforming site pages. Organic – Visitors who come to the website after searching on a search platform such as Google. Paid – Visitors who find the website via a Google Ads advert or other paid search ad – this type of traffic only appears if the business is paying for an advertising campaign. Referral – Visitors who come to the website by clicking on a link from another website. Social – Visitors who come to the website by clicking on a link from a social media platform such as Facebook or Twitter. In order to see a summary of channel performance for the website, head to Acquisition > Overview. Within this section, it shows which channels are driving the most traffic to the website and how users coming via each channel are performing enabling the business to measure return on investment across marketing activity. Whilst sessions and page views are good metrics to track they mean very little if the site isn’t generating conversions. Within Google Analytics, conversions are measured through the goals feature, allowing a business to track things like contact form completions, downloads, engagements and more; these conversions can be given a value to ascertain which channels are providing the best return on investment. Time on site > 5 minutes. Pages per session > 3.
Business owners or employees, engage with the website in a completely different way to potential customers, often spending longer on the site and engaging with more pages; this can cause big skews in analytics data. 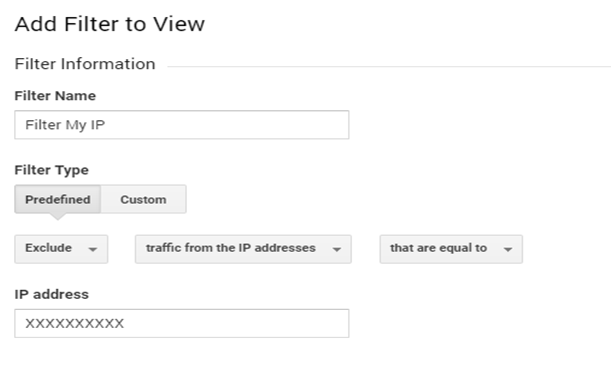 The way to prevent this is to filter out all relevant IP addresses for the business from the data using the admin panel. 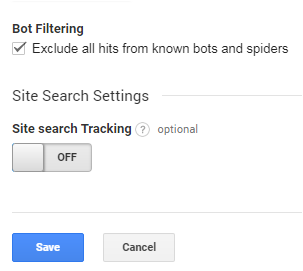 At a basic level, Google Analytics offers a filter for the blocking of web bots and spiders from spam sites. If this is not done the total sessions to the site will include these visits (shown under referral traffic) which not only makes the overall figures higher but in turn can negatively impact the engagement statistics. The above provides a brief overview of the way in which Google Analytics can help businesses to understand how well their website is performing. It does however only scratch the surface of the invaluable data that this tool can provide. More information can be obtained by visiting Google Analyticshttps://analytics.google.com/analytics/web/ which includes a range of tutorials on using the platform. All Things Web® is a full service digital marketing agency with offices in Bristol and Swindon providing consultancy and outsourcing services as well as 1-2-1 training on a range of topics including Google Analytics.